CHORA is an institution co-founded by Raoul Bunschoten, who is also its director and most prominent member. It is a cross between an academic research institute, an urban design office and a think-tank for urban policy. Its recently published book Urban Flotsam manoeuvres between a manifesto, a vision on the contemporary city, and a guidebook for urban design education and research. The institution's main aim is to understand, model and transform dynamic processes in complex urban conditions. To that end, it combines practice with research. The book presents the results of this endeavour in theoretical reflection upon the various research projects, explanations of the applied methodology, and concrete proposals for actual sites. CHORA sees urban design as the act of intervening in ongoing urban processes. Its methodology is therefore grounded in thorough analysis of the location. The researchers confront the city right down to the smallest scale. The researcher must hit the streets and engage in direct contact with those involved, be they residents, policy-makers or industrialists. The information gathered is translated into diagrams. Converting specific information about actual sites into abstract notations then makes it possible to compare, manipulate and shape the material studied. Two scales are of genuine importance: exposing global forces that have an impact locally, without always being visible. Only the symptoms of those global forces are apparent on the surface. Events occurring at a global level can have consequences at a local level (that of the city or neighbourhood). A number of metaphors, almost poetic notions, are introduced in order to name urban processes and communicate about them. The 'skin of the earth' is the abstract layer enveloping the earth and in which global forces operate. They include abstract and tangible flows: flows of currency, weather, refugees, political ideas, prevailing fashions, etc. The concrete, physical city, which CHORA calls the second skin, is directly related to these flows. It responds to them, opposes them, or guides them. CHORA advocates dynamic models as means to comprehend the constantly changing city. A static model is incapable of reflecting the flux of the city and is totally inadequate as an instrument for analysis and manipulation. This is currently a topical issue. Architects like Greg Lynn and Michael Bell are ardently attempting to capture urban flux using dynamic (computer) models. To map urban developments, CHORA has determined a set of four processes, with which every location can be analysed. They are Erasure, Origination, Transformation and Migration. Erasure focuses on 'removing' or 'making space', literally or figuratively, by a natural disaster or economic crisis for example. Origination marks the moment when something new begins to happen. Transformation indicates a continuous change between two states of an object or situation, a change with a beginning and end. Migration indicates mobility within the area under study, whether it is an abstract idea or concrete object. The basic set of four processes can be applied in drawing up a schematic model of complex urban dynamics. And their rendering in the form of a model allows latent urban phenomena to be brought into focus, such as interest groups that have yet not been institutionalised but are on the point of organising themselves. When the city is analysed along these lines, one is then able to develop different scenarios for the city that can stimulate public discussion and focus political decision-making. They can even lead to the formation of entirely new interest groups whose views can then be taken on board in further decision-making regarding the city as a whole. After an analysis of sections of the city, at local level, the new information about the city must be ordered so that it can be interpreted. An overall concept for the city can then be developed, which takes into account (and, ideally, exploits) the relationships between all sections. Gearing the developments in the different sections to one another using the dynamic models and developed scenarios is a task for the 'urban conservator' – the urban designer new-style. This manager of urban processes should, by drawing on the acquired insight, be able to devise and guide an optimal course of future development, to the benefit of both the sections and the complete urban area. 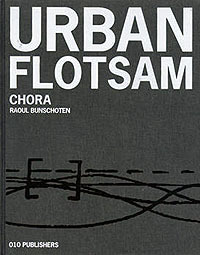 Urban Flotsam is a handsomely designed and bound book, a compilation of essays and projects from the past ten to fifteen years. The presented method offers various tools for analysing and managing the contemporary city. One drawback of this anthology of separate articles, almost all of which have previously been published, is the degree of repetition. Each article, no matter how specific, seeks to clarify the larger picture – without this necessarily leading to a well-rounded whole. Even the title seems to be an omen. The reader is immersed in the ideas of CHORA, the 'flotsam and jetsam', and must piece together the larger picture himself. And usually, the many metaphors do not facilitate an easier understanding of the material.